The Del Ray Business Association presented Taqueria Poblano with the 2019 "Heart of Del Award" on Feb. 8. The annual award, given to the business that represents the heart and soul of Del Ray, is determined by a public vote of neighbors and customers. "We couldn't do it without our staff, business community, and customers," said Taqueria Poblano owner Jeff Wallingford. "A wise man once said, the love you take is equal to the love you make -- and that is what Del Ray is all about." Patrons cited the restaurant's welcoming atmosphere in their nominations. "A neighborhood favorite -- like Cheers where you walk in and they know your name," read one nomination. "We love the food and love to take friends from out of town because it always feels so welcoming," said another customer. “Besides the best margaritas ever, the staff is always friendly and happy to see you. Taqueria Poblano is the heart and soul of Del Ray.” Many nominations also cited Taqueria Poblano's commitment to giving back to the community, particularly through their donations to nonprofits and community events. Since opening in 1999, the restaurant known for its award-winning margaritas and Mexican & L.A.-style cuisine has expanded to include two additional locations in the region. Taqueria Poblano's original Del Ray location will celebrate 20 years this year. Nearly 1,000 neighbors, friends and customers participated in online voting. Past winners of the award include A Show of Hands, Jen Walker McEnearney Associates, Bobi Bomar Homes of Alexandria, The Neighborhood Pharmacy of Del Ray, Greener Cleaner of Del Ray, Del Ray Pizzeria, Mind the Mat Pilates & Yoga, Caboose Cafe, Del Ray Cafe, and Pork Barrel BBQ/Holy Cow/the sushi bar. A business cannot win the award multiple years. The Del Ray Business Association represents the independently-owned restaurants, retailers, and businesses in the Del Ray neighborhood of Alexandria; DRBA also hosts community events, including First Thursdays, Taste of Del Ray, The Del Ray Halloween Parade, The Alexandria Turkey Trot, and more. For more information, visit www.visitdelray.com. Every February, the Del Ray Business Association presents the Heart of Del Ray Award to the business that serves as the heart and soul of Del Ray, as determined by a public vote of neighbors and customers. Selection is based on which business best demonstrates their warm and welcoming attitude, their commitment and generosity to the community, and to their overall contribution to the Del Ray community. Over 20 years ago, Evening Star Cafe put Del Ray on the culinary map -- and its star continues to rise, as the restaurant continues to be a favorite in the region, recently making the Washington Post food critic's list of favorite restaurants. "Between the menu of the Star, the cozy back bar, and the awesome kid-friendly summer patio, it's always the place to go," said one regular customer. Others nominating Evening Star Cafe touted the numerous ways they are involved in the vibrant Del Ray community that they helped build. One non-profit leader wrote, “One night, the Evening Star kitchen was too busy to cook a promised donation for an event, and [owner] Stephanie [Babin] went home and cooked it herself!” The restaurant often sponsors community events, supports local schools and non-profits, and offers their space for community events, such as free monthly film screenings with Del Ray Films. Check out www.visitdelray.com for a list of film screenings. Four Directions Wellness has emerged as a leader in Del Ray's health and wellness community, known as Well Ray. "Mara brings health, wholeness and balance to her clients and students," said one client. "The services that she offers are more important than ever in these stressful times. Her holistic, loving approach was exactly what I needed to guide me through of one of the most difficult times in my life, especially when the only answer offered by the medical community was medication." Another individual wrote, "She is a treasure in Del Ray and I am so grateful to have found her. She is a passionate health and wellness coach, and really understands the need for aligning your body, mind, emotions and spirit." In addition to working with local non-profits, Four Directions Wellness offers "Mindfulness Mondays," a free community meditation every other Monday that is open to all; check www.visitdelray.com for dates. After his dog saw great health improvements after transitioning to an all-natural diet, Chris Gabriel became an expert in the area -- and shares that knowledge with every pet owner that walks through the door of Nature's Nibbles. "Chris is so knowledgeable and passionate about what he does," said one customer. "Every pet is like family at Nature's Nibbles. And Chris takes care of the humans too -- they offer free delivery, especially to seniors" In addition to hosting adoption events for local rescue centers, the recent government shutdown was a reminder of how interconnected the Nature's Nibbles community is; not only did the retailer provide discounts to furloughed pet parents, but a network of customers also provided a wall of gift cards for those impacted. Founded by Alexandria native John Patrick, ROAM was created "to be an all-inclusive music center to provide the area with all of its musical needs." It's a mission that Patrick brings to everything he does -- not only does he teach up-and-coming musicians, but he volunteers countless hours chairing the volunteer-run Del Ray Music Festival each July, which brings top local talent to the neighborhood. "John Patrick and his incredibly talented group of instructors are creating an incredibly positive community of musicians and music lovers in our neighborhood," read one nomination. "His work will have lasting impacts, not only on the lives of the students, but also on the cultural opportunities and lives of all of us." Another wrote, "They truly do embody the heart of Del Ray as they are building a safe community for our kids, all while embracing the arts! This place continues to grow a love of music for many kids in the area. Challenging them while having fun and performing around the city. The end results are amazing and fill the kids with such a sense of accomplishment and self esteem." Whether it's an impromptu meeting of Mount Vernon Community School PTA parents or a top-secret reception to woo Amazon executives, great things happen over the legendary biscuits at Stomping Ground. "Stomping Ground is everything a great neighborhood restaurant should be -- amazing food, friendly staff, and you're almost guaranteed to run into one of your neighbors there, " said one regular. Others touted the restaurant's special events, like post-Halloween Parade porch parties and pig roasts, that bring the community together. And the restaurant is committed to buying local -- the chef regularly shops and plans menu items around produce available at the Del Ray Farmers’ Market, and provides coffee and biscuits for the farmers on Saturday mornings. While Taqueria Poblano is known in the region as home to the DC area's best margaritas, inside Del Ray, the restaurant is known for its welcoming atmosphere and dedication to the community. "A neighborhood favorite -- like Cheers where you walk in and they know your name," said one customer. "We love the food and love to take friends from out of town because it always feels so welcoming." Others nominating Taqueria noted the restaurant's support community of events. “When you send an email out asking for gift cards or a donation of some sort, [owner] Jeff [Wallingford] is the always the first to respond -- and always helps our nonprofits,” read one nomination. Visit tinyurl.com/2019heartofdelray to vote; voting closes at noon on Th., Feb. 7. A large heart-shaped award will be displayed on the winning business on Fri., Feb 8 to greet them for the Valentine’s Day weekend. Last year, nearly 1,000 neighbors, friends and customers participated in online voting. Past winners of the award include A Show of Hands, Jen Walker McEnearney Associates, Bobi Bomar Homes of Alexandria, The Neighborhood Pharmacy of Del Ray, Greener Cleaner of Del Ray, Del Ray Pizzeria, Mind the Mat Pilates & Yoga, Caboose Cafe, Del Ray Cafe, and Pork Barrel BBQ/Holy Cow/the sushi bar. Alexandria Turkey Trot Donates Over $5,000 and 2,008 Pounds of Food to ALIVE! 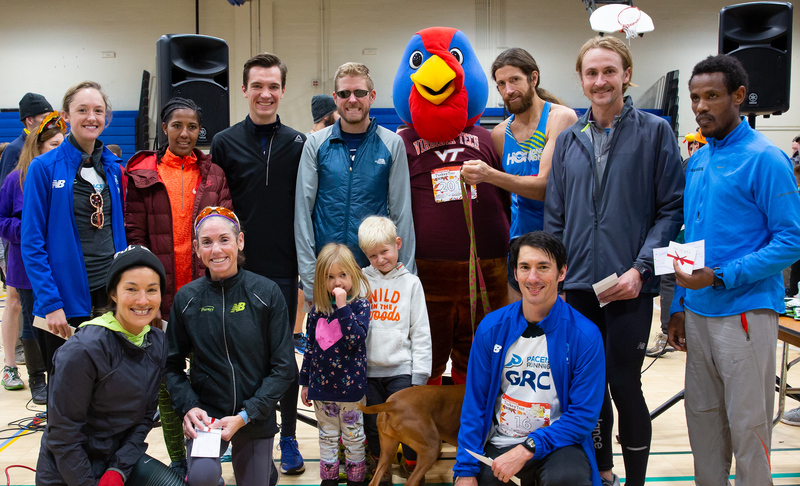 The 43rd Annual Alexandria Turkey Trot raised $5,000 for ALIVE! ; runners also donated 2,008 pounds of food, plus an additional $485 in cash donations. Despite the coldest Thanksgiving morning in over 20 years, over 4,000 runners finished the five-mile run, and a new women's course record was set, with Birtukan Alemu of Washington, D.C. finishing the race in 26 minutes, 21 seconds. The Alexandria Turkey Trot is sponsored by the Del Ray Business Association and DC Road Runners. Complete results are available at www.alexandriaturkeytrot.com. The Del Ray Holiday Season Kick-Off will take place on Saturday, Dec. 1 at 6 p.m. at the Pat Miller Neighborhood Square, beginning a month-long holiday celebration. The holiday activities reflect the Del Ray neighborhood's reputation as a dining, retail, wellness, and arts destination in the region, along with its commitment to supporting Alexandria non-profits year-round. Holiday Season Kick-Off: The Del Ray community will come together on Sat. Dec 1 at 6 p.m. for the annual Christmas tree and Menorah lighting at the Pat Miller Neighborhood Square, located at the intersection of Mount Vernon and Oxford Avenues. The event features an appearance by Santa, who will lead carols and sit for photos with children. Participants are urged to bring toiletries, diapers, gift cards for Target or Wal-Mart or Metro SmartTrip cards for Carpenter’s Shelter. Continue the celebration (and start your holiday shopping!) with a stroll down Mount Vernon Avenue, which will be illuminated by thousands of luminarias in honor of the late Nancy Dunning. Del Ray Holiday Pop-Up Market: Find one-of-a-kind gifts made by local artisans and at-home entrepreneurs on Sat., Dec. 2 from 11 a.m. to 3 p.m. at the Pat Miller Neighborhood Square. Shops of Del Ray’s Ladies’ Night Out: Join the Shops of Del Ray on Thurs., Dec. 6 from 6 p.m. to 9 p.m. to shop local and enjoy special promotions — all while sipping Virginia wine. Find the perfect gift on The Avenue or at an outdoor pop-up market featuring local artisans at the Del Ray Psych & Wellness parking lot, located at the intersection of Mount Vernon Avenue and Bellefonte Avenue. All events are presented by the Del Ray Business Association, which represents the independently-owned shops, retailers, and businesses in the Del Ray neighborhood of Alexandria. A Thanksgiving morning tradition, the 43rd annual Alexandria Turkey Trot is the Mid-Atlantic's premiere Turkey Trot. With nearly 6,000 runners -- including some of the fastest elite runners on the east coast -- the Turkey Trot is a great way to start your Thanksgiving morning. The five-mile run/walk, which takes place at 9 a.m. on Th., Nov. 22, goes through the heart of Del Ray, starting and ending at George Washington Middle School. The event is Metro accessible via the Braddock Road Metro Station. Dogs and strollers are welcome, and have their own starting area. In the spirit of the holiday, runners and spectators are encouraged to bring two nonperishable food items to support ALIVE!, a nonprofit organization serving Alexandria’s needy. For complete information on the race and to register, visit www.alexandriaturkeytrot.com. One of Del Ray's favorite traditions, the 22nd Annual Del Ray Halloween Parade, will take place on Sunday, Oct. 28 at 2 p.m. along Mount Vernon Avenue. The parade, which begins at E. Bellefonte Ave., ends with a party at the Mt. Vernon Recreation Center fields featuring live music, goodie bags for children, free refreshments, children's games, awards for Best Decorated Stroller, House, Business & Best Pet Costume, and more. The event is free and open to all. 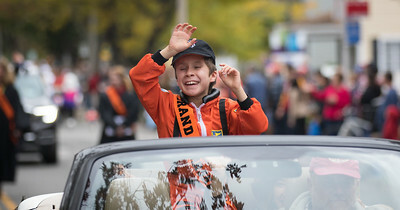 Last year’s parade had more than 7,500 participants, which included over 2,500 children, special dignitaries and elected officials. Leading this year's parade as Grand Marshall will be an outstanding student selected to represent Mount Vernon Community School. Best Decorated House and Business: The deadline for nominations for Best Decorated House and Best Decorated Business is Sunday, October 21 at 12 p.m. To nominate a home or business, email the street addresses to delrayhalloweenparade@yahoo.com by October 21; please state if it should be judged during the day or night. Spooky Bean Halloween: After the parade from 5 p.m. to 8 p.m., families can enjoy the Spooky Bean Halloween Maze, constructed by Bean Creative. This free event is appropriate for all ages, and located on the 2200 block of Mount Vernon Avenue. Donations are accepted at the gate to support the Leukemia & Lymphoma Society. Costumes for Children In Need: The Del Ray Business Association collects and distributes Halloween costumes for children who would otherwise go without. New or gently used costumes can be dropped off at collection bins at the Pat Miller Neighborhood Square (located at Oxford & Mount Vernon Ave.) or on the porch at 110 E. Del Ray. Costumes are distributed the day before the parade from 2-4 p.m. at the Mt. Vernon Recreation Center, 2701 Commonwealth Ave. In 2017, over 200 costumes were distributed.